Using Zapier, you can connect LiveChat to a number of different services to store chat transcripts, create new contacts in your CRM and much more. In this tutorial you’ll find instructions on how to create a Zap. 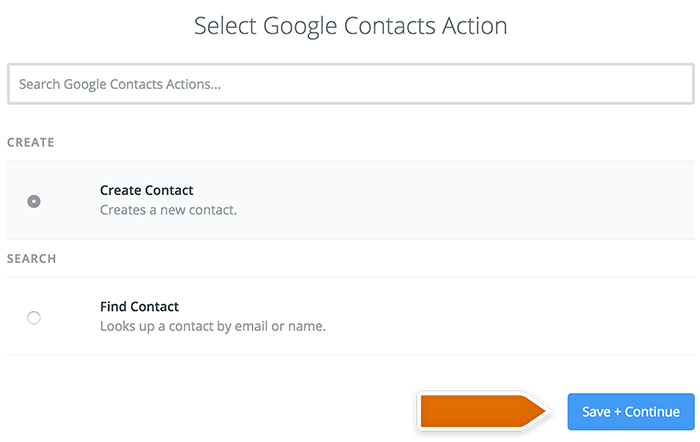 We explain it on an example integration between LiveChat and Google Contacts. Take a look at the list of the most popular LiveChat Zaps with the setups. You can also use our most popular Zaps straight from your LiveChat app. Click here to visit our Integrate using Zapier section and use new Zaps without the need to leave your LiveChat! 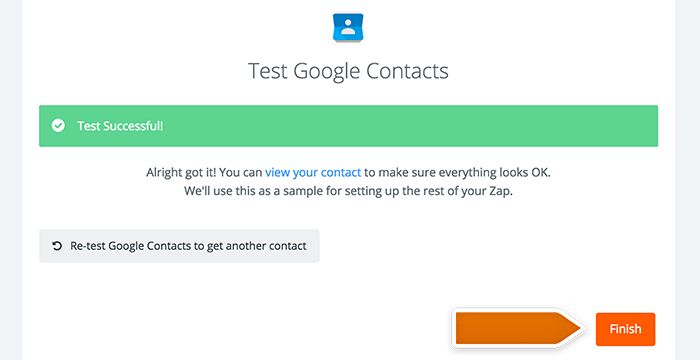 For the purpose of this tutorial, we will create an example Zap that will add a new Google Contact entry for each person that started a chat with you. Start off by logging in to Zapier and click on Make a Zap in the upper menu. Select New Chat to be your Trigger. Click on Connect a New Account and then provide your LiveChat login email and the API key. Next, click on the orange button at the bottom. Log in to Google Account you want to use by providing login and password. 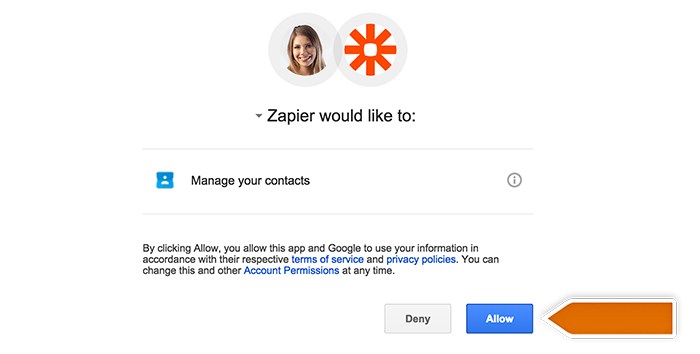 Allow Zapier to manage your contacts. Test the account and click on Continue if it checks out. 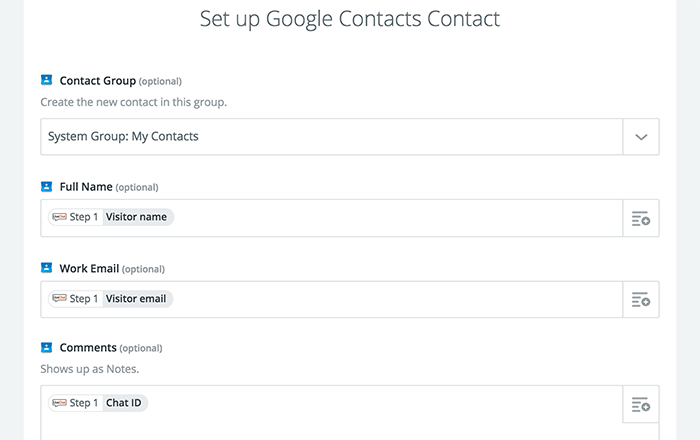 Next, set up how a new contact will show up in Google Contacts by choosing the data that will be forwarded. After you finish, click on Continue button to proceed. Next, click on orange Finish button. Turn the Zap on by clicking on the grey switch and start passing information from LiveChat to Google contacts. Congrats, you have just created your first Zap! At the start of each chat, it will save your visitor’s name, email address and add a chat ID of the conversation as a comment. This is just one of the ways you can set this integration. For example, you can set the trigger to fire when the chat is finished. 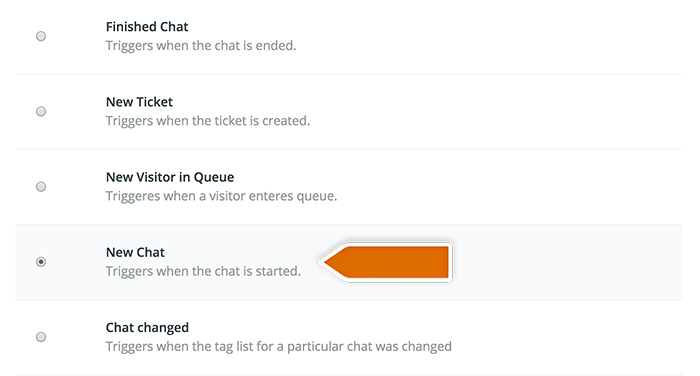 You can also add Chat Started and Chat Ended variables to the Comments section to get information when the chat started and ended. Check out this example Zap to see how it looks like with those variables added. Try creating Zaps for other services you are using to simplify your work! 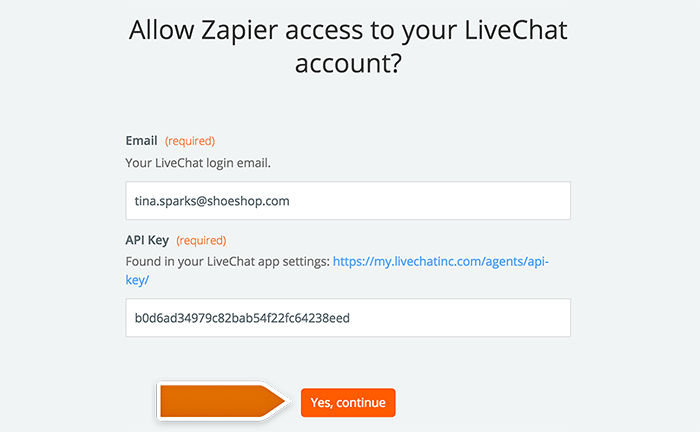 If you are looking for other integrations with LiveChat through Zapier, visit LiveChat zapbook.